World champion Kell Brook will miss a planned December world title defence after being stabbed in the leg but hopes to be back in early 2015. 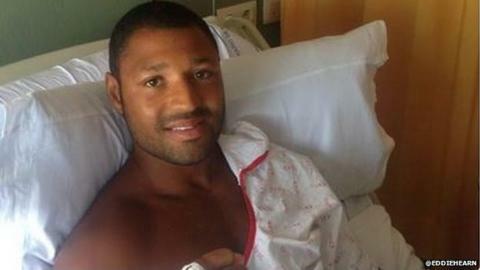 Sheffield's IBF welterweight champion, 28, remains in a "stable" condition in a Tenerife hospital. Brook says he suffered stab wounds to his leg after "an unprovoked attack" in the early hours of Thursday. He was on holiday on the island with his pregnant partner Lindsey and two-year-old daughter. Commenting from his hospital bed, Brook said: "I'm devastated right now after being on such a high having achieved my dream of becoming world champion in Los Angeles last month. "This is obviously a major setback but the thought of defending my title is what's keeping me positive right now. I want to thank everyone for their support and ask for privacy for myself and my family at this time. "Make no mistake - I will be back." Brook, who was was also stabbed in Sheffield in 2007, won the IBF welterweight title when he beat American Shawn Porter in California last month. The victory stretched his unbeaten professional record to 33 fights. "We were all glad to get out here and see Kell for ourselves," said the boxer's promoter Eddie Hearn. "The important thing now is to get him home and, after some rest, begin physiotherapy on his injuries. "His first defence was planned on 6 December, which is now unrealistic, but we fully expect Kell to be back in the ring early next year." Brook will spend the weekend in hospital and will return to Sheffield on Monday to begin his rehabilitation.